2015 is turning out to be an excellent year for Indian employees. As per the recent 2015-16 Asia Pacific Salary Budget Planning report prepared by leading professional services company Towers Watson’s Data Services Practice (TWDS), it was revealed that Indian employees received highest salary increase amongst all APAC (Asia Pacific) nations. Indian corporate sector approved salary increase upto 10.8% for their employees, which beats China (8.6% increase); Australia (3.5%); Japan (2.5%) and other nations. Closely following India is Indonesia, where employees received appraisal upto 9.5%. 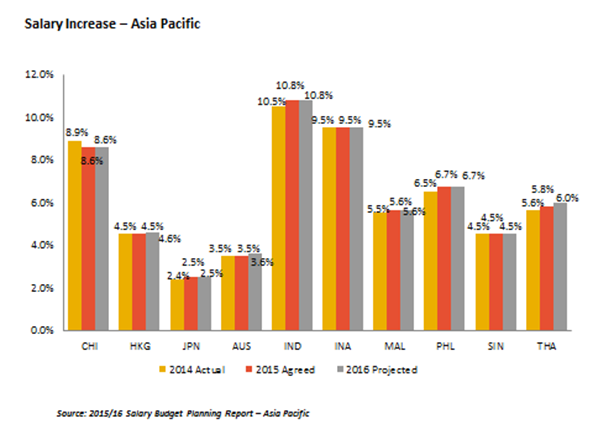 Philippines at 6.7% is also performing well, when it comes to salary increase. Salary provided to employees & the annual appraisal is a direct result of the company’s health and their futuristic outlook. The appraisal which employees receive has far more deeper implications with regards to the country’s economic health, inflation and sometimes the price of oil as it effects the currency exchange rates as well. If we calculate the inflation, which was around 7.2% last year, the overall salary increase amounted to 5%, which increased from 3.3% last year. 87% of all respondents admitted that they will allocate a larger portion of their budget to their top performing employees, while 11% shared that they will allocate 100% of their budget increase to top performers. The reports says that top performers in India received an annual salary appraisal of 12%, which is 30% higher than ‘average performers’ and almost double of the national average. This is one area where Indian corporate industry is lagging behind other Asia-Pacific nations. 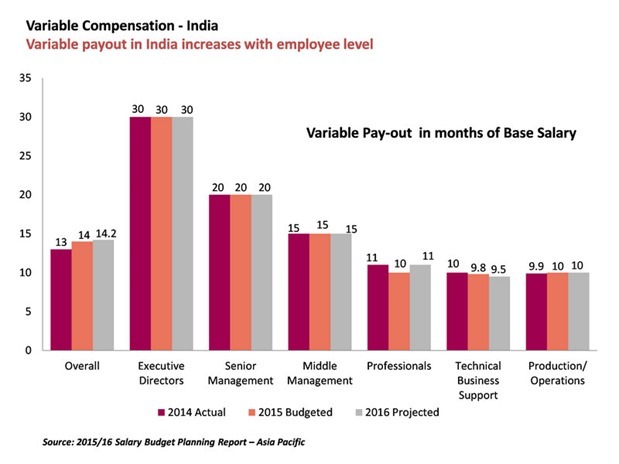 Indian employers are still giving much less pay for performance incentives to their employees. 1.69 months of average salary base was provided to Indian employees as a pay for performance reward, whereas its 1.93 months in China, and 1.81 months in Hong Kong and Singapore. This proves the fact that it’s the cash in hand number which still rules the chart in India. But in order to motivate and inspire more employees to breach their own limitations, pay for performance needs to be increased in India. When it comes to variable pay compensation, then Senior Management is expected to receive 20% of the basic pay, and Executive Directors will receive around 30%. This report was created after understanding and analyzing Indian corporations’ compensation planning outlook for 2015, and after surveying around 2000 employees from 19 countries in Asia Pacific. A range of job postings from ‘factory shop floor to executive suite’ were considered for this survey.